CURT cargo bags are the ideal way to keep your belongings well protected from water, dirt, road grime and even wind damage, all while being easy to manage and perfectly fitted for a CURT cargo carrier or roof basket. Unlike other cargo bags that use a thin vinyl material, our cargo bags are made from a thick UV-resistant vinyl and have welded seams to be truly waterproof. Thick, 1" wide polypropylene straps keep the bag firmly attached to the carrier and ensure your belongings will not jostle around.This CURT cargo bag comes with a heavy-duty zipper that wraps 1/2 way around the bag and hook-and-loop flaps to keep the zipper completely covered and the inside of the bag totally dry. For a little extra security, the zippers are able to be joined together and feature large holes to accept a padlock. This particular CURT cargo bag offers 13.5 cu. 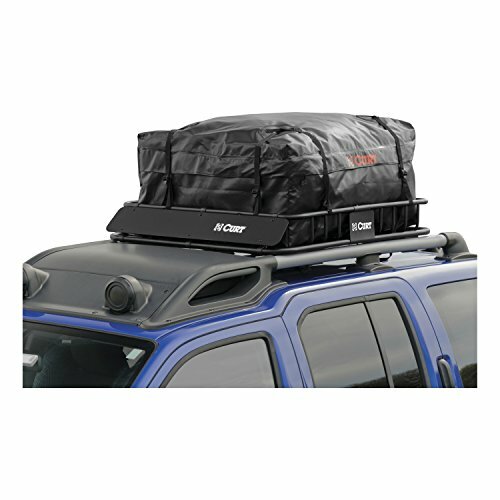 ft. of storage area and is a perfect fit for the CURT roof-mounted cargo basket. All of our cargo bags are easy to fold up for compact storage and come with a one-year warranty.